Photo: Timothy Davis House, ca. 1849, 405 1st Street, NW, Elkader, IA. Listed on the National Register of Historic Places in 1976. Photographed by User:Kevin Schuchmann (own work), 2014, [cc-by-3.0 (creativecommons.org/licenses/by/3.0)], via Wikimedia Commons, accessed March, 2016. 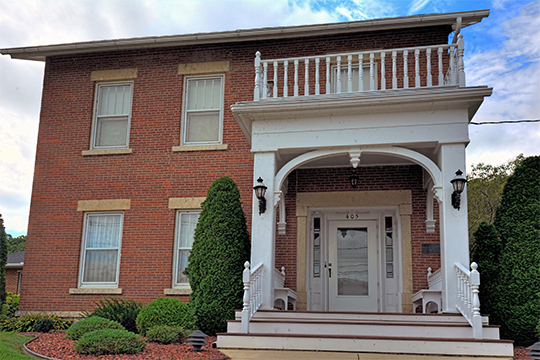 Clayton County administrative offices are located at 111 High Street NE, Elkader, IA 52043; phone: 563-245-2204. Clayton County was organized in 1837. It was named for John Middleton Clayton [1796-1856], U.S. Senator from Delaware (1853-1856) and U.S. Secretary of State (1849-1850) under President Zachary Taylor.